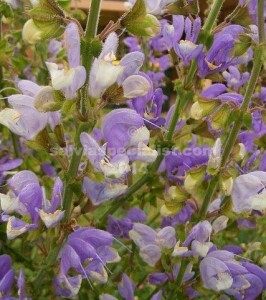 A well grown salvia barrelieri in flower will stop gardeners in their tracks. It has 1.5m spikes of mauve flowers like a delphinium. The latter are lovely plants but often hard to grow in hot areas. I don’t think barrelieri would grow in humid areas. Cold is not a problem. It likes average moisture, it comes from Northern Africa which indicates it doesn’t want to be too wet, so a well drained sunny position should suit. It doesn’t seem to be long lived for me or easy to grow but when it does flourish it sets a lot of seed. A few will be available mid May.